The participants in the 24th Chubu Time Prediction Race start on the signal gun at the Okinawa Comprehensive Athletic Park in Okinawa City on November 17 (photograph provided by Akiko Kuwabara). 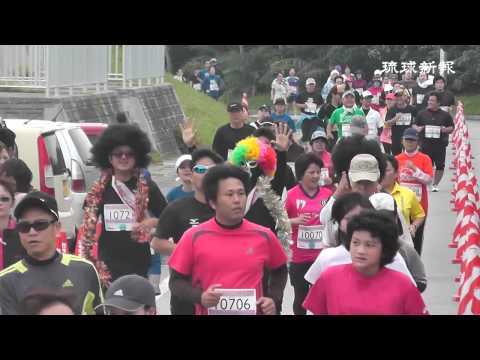 The 24th Chubu Time Prediction Race was held at the Okinawa Comprehensive Athletic Park in Okinawa City on November 17. 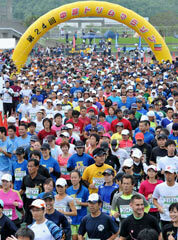 About 3,800 people from among 4,232 applicants took part in the four categories of 20, 10, 5 and 3 kilometer races, with 3,756 people finishing. About 98 percent of the participants completed the distance they had registered for. In the 20 kilometer race, a prize was awarded to one person for matching their predicted time. The race accommodated athletes trying to improve personal best times, families with young children and the elderly. Wheelchair runners also participated at their own pace. Volunteers who supplied water and local residents standing along the roadside cheered the runners along, adding excitement to the event.